We had a little chat to Vicki Lever from Old Soles shoes about her collections for babies and toddlers up to twenty-four months. We loved the baby sneaker-style shoes and the pretty Mary-Janes for girls featuring cutouts. The beauty of Old Soles shoes is that they come higher up the ankle and are securely fastened without restricting the movement of the foot, and ensuring they don’t fall off easily. The pre-walkers have leather soles while the First Steps range have a non-slip rubber surface to help prevent accidents in those new to the walking game! It was lovely to see patent-tipped shoes in colours other than pink, as well as that lovely favourite colour of so many little girls. I had a particular thing for the blue metallic beauties at the far left. Nice to have met you Vicki and we love Old Soles! 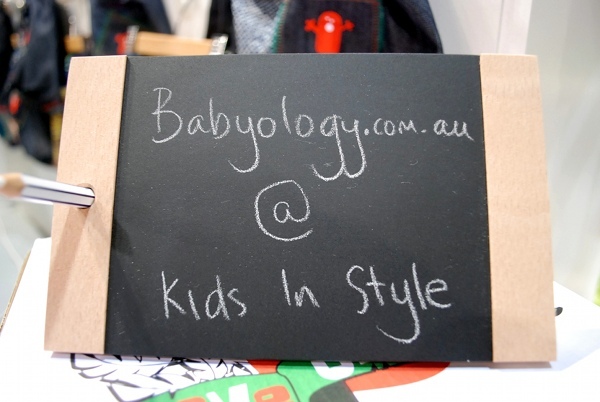 We have more editorial coming to you from Babyology at Kids Instyle Sydney 2011.